1. Kaewkhao, J., Chewpraditkul, W., 2006, “Effective Atomic Numbers of Cu/Zn Using Transmission Experiment” , KMITL International Conference on Science and Applied Science 2006, King Mongkut’s Institute of Technology Ladkrabang, Swiss Hotel Bangkok, Thailand, March 8 – 10, p137. 2. Kaewkhao J., Laopaiboon J. and Chewpraditkul W., 2007, “Effective Atomic Number of Ag/Cu/Zn Alloy for Photoelectric Process at 59.5 keV” International Conference on Engineering, Applied Sciences, and Technology (ICEAST 2007), November 21-23, Swissôtel Le Concorde, Bangkok, Thailand, pp. 100-102. 3. Kaewkhao J., Laopaiboon J. and Chewpraditkul W., 2007, “Study on Glasses from Local Sand in Western Thailand ” International Conference on Engineering, Applied Sciences, and Technology (ICEAST 2007), November 21-23, Swissôtel Le Concorde, Bangkok, Thailand. pp. 107-110. 4. Kaewkhao J., Pokaipisit A. and Chewpraditkul W., 2008, “Effect of Bi2O3 Content on the Optical Band Gap and Properties of Bi2O3-BaO-B2O3 Glass System”, International Conference on Smart Materials Smart/Intelligent Materials and Nanotechnology, April, 22-25, Imperial Mae Ping, Chiang Mai, Thailand p. 373. 5. Kaewkhao J., Limsuwan P. and Udomkan N., 2008, “ESR Absorption Spectra of Copper (II) Ions in Glasses”, International Conference on Smart Materials Smart/Intelligent Materials and Nanotechnology, April, 22-25, Imperial Mae Ping, Chiang Mai, Thailand p. 364. 6. Kaewkhao J., Pokaipisit A. and Limsuwan P., 2008, “Optical Spectroscopy of Glass Doped with Cr2O3” Proceeding on APCTP – ASEAN Workshop on ADVANCED MATERIALS SCIENCE AND NANOTECHNOLOGY, September, 15-21, Yasaka Hotel, Nha Trang City, Veitnam , pp.465-468. 7. Kaewkhao J. , Tuscharoen s. and Chewpraditkul W., 2008, “Non-Lead Glass for Gamma-Rays Shielding Materials at 662 keV”, Proceeding on APCTP–ASEAN Workshop on ADVANCED MATERIALS SCIENCE AND NANOTECHNOLOGY, September, 15-21, Yasaka Hotel, Nha Trang City, Veitnam , pp.1063-1069. 8. Kaewkhao J. and Limsuwan P., 2009, “Imitation Gem from Rice Husk Ash”, Proceeding on International Conference: Sustainable Development to Save the Earth: Technologies and Strategies Vision 2050,April, 7-9, Millennium Hilton Bangkok Hotel, Bangkok, Thailand pp. 807-809. 9. Kaewkhao J. and Chewpraditkul, W., 2009, “Gamma-Rays-Shielding Properties of Bi2O3-BaO-B2O3 Glass System”, Proceeding on International Conference: Sustainable Development to Save the Earth: Technologies and Strategies Vision 2050., April, 7-9, Millennium Hilton Bangkok Hotel, Bangkok, Thailand pp. 810-813. 10. Tuscharoen S., .Kaewkhao J. and Chewpraditkul W., 2009, “Optical and Physical Properties of xBaO : (100-x)B2O3 Glass System”, Proceeding on International Conference: Sustainable Development to Save the Earth: Technologies and Strategies Vision 2050., April, 7-9, Millennium Hilton Bangkok Hotel, Bangkok, Thailand pp. 890-892. 11. Kaewkhao, J., and Limsuwan P., 2009, “Gamma-Rays Interaction Bi2O3 PbO and BaO in Silicate Glass at 662 keV : Theoretical Calculation” Proceeding on The 5th International Symposium on Radiation safety and Detection Technology (ISORD-5), July, 15-17, Kitakyushu International Conference Center, Kitakyushu, JAPAN, p. 165. 12. Tuscharoen, S., Kaewkhao, J., Limsuwan, P. and Chewpraditkul W., 2009, “Development of BaO : B2O3 : Fly Ash Glass System for Gamma-rays shielding Materials” Proceeding on The 5th International Symposium on Radiation safety and Detection Technology (ISORD-5), July, 15-17, Kitakyushu International Conference Center, Kitakyushu, JAPAN, p. 166. 13. Chimalawong P., Kaewkhao J. and Limsuwan P., 2009, “Optical Investigation and Electronic Polarizability of Nd3+ Doped Soda-Lime-Silicate Glasses”, Proceedings of the International Conference on Science, Technology and Innovation for Sustainable Well-Being (STISWB 2009), July, 23-24, Pullman Raja Orchid Hotel, Khon Kaen, Thailand, pp. 555-560. 14. Limkitjaroenporn P., Chewpraditkul W., Kaewkhao J., Tuscharoen S., 2009, “Effective Atomic Number of Lead Sodium Borate Glass Systems at 662 keV” Proceedings of the International Conference on Science, Technology and Innovation for Sustainable Well-Being (STISWB 2009), July, 23-24, Pullman Raja Orchid Hotel, Khon Kaen, Thailand, pp. 573-577. 15. Kaewwiset, W., Kaewkhao, J. and Limsuwan, P., 2009, “Optical Properties of Erbium Doped Soda-Lime-Silicate Glasses”, Proceedings of the International Conference on Science, Technology and Innovation for Sustainable Well-Being (STISWB 2009), July, 23-24, Pullman Raja Orchid Hotel, Khon Kaen, Thailand, pp. 578-583. 16. Kuruthomajaru, S., Kaewkhao, J and Udomkan, N., 2009, “Temperature Effects On P. Undulata As Investigates By XRD, FTIR, EDXRF and ESR Technique” Proceedings of the International Conference on Science, Technology and Innovation for Sustainable Well-Being (STISWB 2009), July, 23-24, Pullman Raja Orchid Hotel, Khon Kaen, Thailand, pp. 961-964. 17. Kaewwiset, W., Kaewkhao, J. and Limsuwan, P., 2009, “UV-Visible-NIR Study of Er3+ Doped Soda Lime Silicate Glass”, Proceedings of the International Conference on the Role of Universities in Hands-On Education, August, 23-29, Rajamangala University of Technology Lanna, Chiang Mai, Thailand, 1-9. 18. Kaewkhao, J., and Limsuwan P., 2009, “Interaction of Phosphate Glass Containing with Bi2O3 PbO and BaO at 662 keV” Proceeding on The 11th International Symposium on Radiation Physics” (ISRP-11), September, 20-25, Melbourne University, Melbourne, AUSTRALIA, p. 158. 19. Chanthima, N., Kaewkhao, J., Tuscharoen, S. and Limsuwan, P., 2009, “Fabrication of xBi2O3(100-x)SiO2 glasses system as gamma-ray shielding materials” Proceeding on The 6th International Symposium on Advance Materials in Asia Pacific Rims (6th ISAMAP), Chulalongkorn University, Thailand. pp. 25-31. 20. Chimalawong P., Kaewkhao J. and Limsuwan P., 2009, “Spectroscopic Studies of Nd3+ Doped Soda-Lime-Silicate Glasses” Proceeding on The 6th International Symposium on Advance Materials in Asia Pacific Rims (6th ISAMAP), Chulalongkorn University, Thailand. pp. 18-24. 22. Srisittipokakun, N., Kedkaew, C., Kaewkhao, J. and Limsuwan, P., “Coloration in Soda-Lime- Silicate Glass System Containing Manganese” International conference on Functionalized and Sensing Materials (FuSeM 2009), 7-9 December 2009, Chulabhorn Convention Center, Bangkok, Thailand, p.94. 23. Chimalawong, P., Kaewkhao, J. and Limsuwan, P., “Effect of Nd3+ Concentration on the Physical and Absorption Properties of Soda-Lime-Silicate Glasses”, International conference on Functionalized and Sensing Materials (FuSeM 2009), 7-9 December 2009, Chulabhorn Convention Center, Bangkok, Thailand, p. 97. 24. Kirdsiri, K., Kaewkhao, J., Chewpraditkul, W. and Limsuwan, P., “Photon Interactions in Borate Glass System Containing Bi2O3, PbO and BaO at 60 keV: Theoretical Calculation”, International conference on Functionalized and Sensing Materials (FuSeM 2009), 7-9 December 2009, Chulabhorn Convention Center, Bangkok, Thailand, p. 98. 25. Chanthima, N., Kaewkhao, J., Chewpradikul, W. and Limsuwan, P., “Gamma-Rays Absorption Studies of PbO-SiO2 Glass System”, International conference on Functionalized and Sensing Materials (FuSeM 2009), 7-9 December 2009, Chulabhorn Convention Center, Bangkok, Thailand, p. 99. 26. Limkitjaroenporn, P., Kaewkhao, J., Tuscharoen, S., Limsuwan, P. and Chewpraditkul, W, “Structural Studies of Lead Sodium Borate Glasses”, International conference on Functionalized and Sensing Materials (FuSeM 2009), 7-9 December 2009, Chulabhorn Convention Center, Bangkok, Thailand, p.103. 27. Boonin, K., Kaewkhao, J. and Limsuwan, P., “Optical Investigation of Bi2O3-B2O3 Glass System”, International conference on Functionalized and Sensing Materials (FuSeM 2009), 7-9 December 2009, Chulabhorn Convention Center, Bangkok, Thailand, p. 197. 28. Kaewkhao, J., Kedkaew. C, Kittiauchawal, T., Chanthima, N., Kirdsiri, K. and Limsuwan, P., “Total and Partial Photon Interactions of Silicate Glass System at 60 keV for Shielding Properties Investigation: Theoretical Calculation” Proceeding of Pure and Applied Chemistry International Conference 2010, 21-23 January 2010, Sunee Grand Hotel and Convention Center, Ubon Ratchathani, Thailand p. 655-658. 29. Kedkaew. C., Kittiauchawal, T., Kaewkhao, J., Smith, S. and Limsuwan, P., “Calculated the Spin Hamiltonian Parameters of Fe3+ ion in Blue Sapphires” Proceeding of Pure and Applied Chemistry International Conference 2010, 21-23 January 2010, Sunee Grand Hotel and Convention Center, Ubon Ratchathani, Thailand p. 612-614. 30. Kedkaew, C., Kaewkhao, J., Insiripong, S., Chantima, N., Tamaphat, N. and Limsuwan, P., “High Gamma Radiation-Induced the Aluminum Center in Natural -Quartz” Proceeding of 2010 Symposium on Radiation Measurements and Applications, 24-28 May 2010, The Michigan League University of Michigan Ann Arbor, Michigan, USA pp. 126-127. 31. Donthuam, P., Ratana, T., Insiripong, S., Kaewkhao, J., Ratana, T., Siriprom, W. and Limsuwan P., “Magnetic, Optical and Physical Properties of Glass Doped with Iron Oxide” Proceeding of the 2nd International Conference on Advance Magnetic Materials and application , 12-16 July 2010, Sendai International Center, Sendai, Japan p. 14. 32. Donthuam, P., Kaewkhao, J., Siriprom, W., Asavavisithchai, S. and Limsuwan P., “Crystal Structure and Morphology dependence of the Phase of Molluse Shell: A Case Study of XRD, SEM and ESR” Proceeding of the 2nd International Conference on Advance Magnetic Materials and application , 12-16 July 2010, Sendai International Center, Sendai, Japan p. 55. 33. Tuscharoen, S., Kaewkhao, J., Pongtawee, S., Limsuwan, P. and Chewpraditkul, W., “Structural and Radiation Shielding Properties of Lead Calcium Phosphate Glass System” Proceeding of the International Conference for a Sustainable Mekong Subregion , 26-27 August 2010, The Imperial Queen’s Park Hotel, Bangkok, Thailand pp. 630-632. 34. Kaewkhao J., Kedkaew, C. and Limsuwan, P., “Properties of CoO Doped in Glasses Prepared from Rice Hush Fly Ash in Thailand” ICC 3rd International Congress on Ceramics, 14 – 18 November 2010, Grand Cube Osaka, Osaka, Japan p. 116. 35. Kedkaew, C., Srisittipokakul, N., Kaewkhao J. and Limsuwan, P., “The Effect of Meting Temperature on the Optical Absorption of Soda Lime Silicate Glass Doped with MnO2” Proceeding of ICC 3rd International Congress on Ceramics, 14 – 18 November 2010, Grand Cube Osaka, Osaka, Japan p. 115. 36. Srisittipokakul, N., Kaewkhaco J., Kedkaew, C. and Limsuwan, P., “The Effect of Meting Temperature on the Optical Absorption of Soda Lime Silicate Glass Doped with MnO2” Proceeding of 2nd Rajamangala University of Technology International Congress, 24 – 26 November 2010, Chulabhorn Research Institute, Bangkok, Thailand, pp. 108-111. 37. Boonin, K., Kaewkhaco J., Ratana, T., Nuntawong, N. and Limsuwan, P., “Near Infrared Luminescence of Er3+ Doped Bi2O3-B2O3 Glass System” Proceeding of 2nd Rajamangala University of Technology International Congress, 24 – 26 November 2010, Chulabhorn Research Institute, Bangkok, Thailand, pp. 112-115. 38. Wanarak, C., Chewpraditkul, W., Phunpueok, A. and Kaewkhao, J., “Interaction of 662 keV Gamma Rays with LYSO:Ce and YSO:Ce Single Crystal Scintillators” Proceeding of 2nd Rajamangala University of Technology International Congress, 24 – 26 November 2010, Chulabhorn Research Institute, Bangkok, Thailand, pp. 259-262. 39. Phunpueok, A., Chewpraditkul, W., Limsuwan P., Kaewkhao, J. and Wanarak, C., “Interaction of 662 keV Gamma Rays with YAP:Ce and LuYAP:Ce Single Crystal Scintillators” Proceeding of 2nd Rajamangala University of Technology International Congress, 24 – 26 November 2010, Chulabhorn Research Institute, Bangkok, Thailand, pp. 275-278. 40. Chaiphaksa, Kaewkhao, J., Ratana, T., Ratana, T., and Limsuwan, P., “Structural Properties of Borosilicate Glass at High Iron Oxide Concentration” Proceeding of 2nd Rajamangala University of Technology International Congress, 24 – 26 November 2010, Chulabhorn Research Institute, Bangkok, Thailand, pp. 393-395. 41. Kittimanitkul, A., Tuscharoen, S., Kaewkhao, J., Limsuwan, P. and Sudprasert, W., “Energy and Chemical Composition Dependence of Mass Attenuation Coefficients of Some Building Materials in Thailand” Proceeding of 2nd Rajamangala University of Technology International Congress, 24 – 26 November 2010, Chulabhorn Research Institute, Bangkok, Thailand, pp. 398-401. 42. Kaewkhao, J., Prongsamrong, P., Sila, S., Srisittipokakul, N. and Limsuwan, P. , “Preparation and Properties of Glasses from Local Sand Doped with Fe2O3” Proceeding of 2nd Rajamangala University of Technology International Congress, 24 – 26 November 2010, Chulabhorn Research Institute, Bangkok, Thailand, pp. 390-392. 43. Ruangtaweep, Y., Kaewkhao, J., Kedkaew, C. and Limsuwan, P., “Investigation of Biomass Fly Ash in Thailand for Recycle to Glass Production”, Proceeding of 2nd International Science, Social Science, Engineering and Energy Conference, 15 – 16 December 2010, Nakhonpathom River View Hotel, Nakhonpathom, Thailand, pp. 186-191. 44. Kanjanakul, P., Kaewkhao, J., Insiripong, S., Limsuwan, P. and Kedkaew, C., “Fabrication of Borosilicate Glass using Fly Ash from Industrial Waste”, Proceeding of 2nd International Science, Social Science, Engineering and Energy Conference, 15 – 16 December 2010, Nakhonpathom River View Hotel, Nakhonpathom, Thailand, pp. 210-216. 46. Insiripong, S., Kaewkhao, J., Ratana, T. and Limsuwan, P.,”Optical and Structural Investigation of Bismuth Borate Glasses Doped with Dy3+” Proceeding of 2nd International Science, Social Science, Engineering and Energy Conference, 15 – 16 December 2010, Nakhonpathom River View Hotel, Nakhonpathom, Thailand, pp. 447-453. 47. Boonin, K., Kaewkhao, J., Ratana, T. and Limsuwan, “Preparation and Properties of Bi2O3-B2O3-Nd2O3 Glass System” Proceeding of 2nd International Science, Social Science, Engineering and Energy Conference, 15 – 16 December 2010, Nakhonpathom River View Hotel, Nakhonpathom, Thailand, pp. 487-493. 48. Srisittipokakul, N., Kirdsiri, K., Kaewkhao, J., Kedkaew, C. and Limsuwan, “Absorption and Coloration of MnO2 doped in Soda-Lime Silicate and Soda-Lime-Borate Glasses” Proceeding of 2nd International Science, Social Science, Engineering and Energy Conference, 15 – 16 December 2010, Nakhonpathom River View Hotel, Nakhonpathom, Thailand, pp. 611-616. 49. Siriprom, W., Kirdsiri, K., Kaewkhao, J., Chumnanvej, N., Choeysuppaket, A. and Limsuwan, P., 2011, “Structural and Textural of Marine Mollusc Shell” Proceeding of Chiang Mai International Conference on Biomaterials and Applications 2011 (CMICBA 2011), 9-10 Auguest, 2011, Empress Hotel, Chiang Mai, Thailand, p. 137. 50. Sornsanit, K., Kaewkhao, J. and Limsuwan, P., 2011, “Investigation of Antibacterial Properties of Soda Calcium Borosilicate Glass Doped with TiO2” Proceeding of Chiang Mai International Conference on Biomaterials and Applications 2011 (CMICBA 2011), 9-10 Auguest, 2011, Empress Hotel, Chiang Mai, Thailand, p. 167. 51. Ruangtaweep, Y., Kaewkhao, J., Srisittipokakul, N., and Limsuwan, P., 2011, “Effect of Lead Oxide on Glass Properties Produced from Rice Husk Ash” Proceeding of Chiang Mai International Conference on Biomaterials and Applications 2011 (CMICBA 2011), 9-10 Auguest, 2011, Empress Hotel, Chiang Mai, Thailand, p. 183. 52. Kaewkhao, J. and Limsuwan, P., 2011, “Preparation and Properties of Glass Produced from Palm Branch Ash” Proceeding of Chiang Mai International Conference on Biomaterials and Applications 2011 (CMICBA 2011), 9-10 Auguest, 2011, Empress Hotel, Chiang Mai, Thailand, p. 137. 53. Insiripong,S., Kaewkhao, J., Kedkaew, C., Thamaphat, K., Chamtima, N. and Limsuwan,P., “Iradiation Effect on Natural Quartz from Zambia” Proceeding of 16th International Conference on Radiation Effects in Insulators, 14-19 Auguest, 2011, Peking University, Beijing, Chaina, p. 110. 54. Kaewkhao, J., Kim, H.J., Park, J. Insiripong,S. and Limsuwan,P., “X-Rays Luminescence, Structural and Optical Properties of Bismuth Borate Glass doped with Dy2O3” Proceeding of 16th International Conference on Radiation Effects in Insulators, 14-19 Auguest, 2011, Peking University, Beijing, Chaina, p. 122. 56. Chanthima, N., kaewkhao, J. and Limsuwan, P., “Radiation Shielding Properties of Bismuth Borosilicate Glass”, Proceeding of International Conference on Traditional and Advanced Ceramics”, 22-25 August 2012, The Emerald Hotel, Bangkok, Thailand, p.176. 57. Boonin, K., kaewkhao, J. Nuntawong, N. and Limsuwan, P., “Optical Properties of Er3+ Doped Bi2O2-B2O3 Glass System”, Proceeding of International Conference on Traditional and Advanced Ceramics”, 22-25 August 2012, The Emerald Hotel, Bangkok, Thailand, p.177. 58. Limkitjaroenporn, N., kaewkhao, J., Park, J.M., Kim, H.J. and Limsuwan, P, “Optical Properties of Cerium Doped Bismuth Borate Glass”, Proceeding of International Conference on Traditional and Advanced Ceramics”, 22-25 August 2012, The Emerald Hotel, Bangkok, Thailand, p. 178. 59. Chanthima, N., Boonin, K. and Kaewkhao, J., “Photoluminescence Study of Pr3+ in Bismuth Borate Glass”, Proceeding of 2nd Southeast Asia Conference on Thermoelectric 2012, 30 October 2012, Sakon Nakhon Rajabhat University, Sakon Nakhon, Thailand, p. 33. 60. Boonin, K. and Kaewkhao, J., “Comparative Study of MgO, CaO and ZrO2 on Properties of Glasses Produced from Rice Husk Ash”, Proceeding of 2nd Southeast Asia Conference on Thermoelectric 2012, 30 October 2012, Sakon Nakhon Rajabhat University, Sakon Nakhon, Thailand, p. 34. 61. Wongprom, K., Ruamnikhom, R. and Kaewkhao, J., “Electrical Properties of Soda Lime Silica Glass Doped with Iron (III) Oxide at Different Temperature”, Proceeding of 2nd Southeast Asia Conference on Thermoelectric 2012, 30 October 2012, Sakon Nakhon Rajabhat University, Sakon Nakhon, Thailand, p. 35. 62. Srisittipokakun, N., Kirdsiri, K. and Kaewkhao, J., “Production of Deep Blue Color Glass from Rice Husk Ash Doped with CoO”, Proceeding of 2nd Southeast Asia Conference on Thermoelectric 2012, 30 October 2012, Sakon Nakhon Rajabhat University, Sakon Nakhon, Thailand, p. 36. 63. Kirdsiri, K., Srisittipokakun, N. and Kaewkhao, J., “Estimation of Mass Energy Absorption Coefficient for Borate Host Glass doped BaO, PbO and Bi2O3: Comparative Study”, Proceeding of 2nd Southeast Asia Conference on Thermoelectric 2012, 30 October 2012, Sakon Nakhon Rajabhat University, Sakon Nakhon, Thailand, p. 37. 64. Ruangtaweep, Y., Kaewkhao, J., and Srisittipokakun, N., “Fabrication of Brown Color Glass for Imitation Gemstones”, Proceeding of 2nd Southeast Asia Conference on Thermoelectric 2012, 30 October 2012, Sakon Nakhon Rajabhat University, Sakon Nakhon, Thailand, p. 38. 65. Tuscharoen, S., Ruengsri, S. and Kaewkhao, J., “Measurement of Mass Attenuation Coefficients of Barium Borate Rice Husk Ash at Different Gamma Rays Energy”, Proceeding of 2nd Southeast Asia Conference on Thermoelectric 2012, 30 October 2012, Sakon Nakhon Rajabhat University, Sakon Nakhon, Thailand, p. 39. 66. Srisittipokakun, N., Kirdsiri, K. and Kaewkhao, J., “Production of Deep Blue Color Glass from Rice Husk Ash Doped with CoO”, Proceeding of 2nd Southeast Asia Conference on Thermoelectric 2012, 30 October 2012, Sakon Nakhon Rajabhat University, Sakon Nakhon, Thailand, p. 40. 67. Limkitjaroenporn, P. and Kaewkhao, J., “Variation of Effective Atomic Number with Energy for Amethyst”, Proceeding of 2nd Southeast Asia Conference on Thermoelectric 2012, 30 October 2012, Sakon Nakhon Rajabhat University, Sakon Nakhon, Thailand, p. 41. 68. Kaewkhao, J., “Fabrication of Lead Free High Refractive Index Glasses for Jewelry Industry Applications” Proceeding of 4th International Conference on Matermatics and Naturals Sciences (ICMNS 2012), 8-9 November 2012, Institut Teknologi Bandung, Bandung, Indonesia, p. 58. 71. Tuscharoen, S., Laonarakitti, P. and Keawkhao, J., “Experimental investigation of -ray attenuation coefficients for marble, ceiling and gypsum board”, Proceeding of The 4th International Science, Social Science, Engineering and Energy Conference (I-SEEC 2012), 11-14 December 2012, Golden Beach Cha-Am Hotel, Phetchburi, Thailand, pp. 492-496. 72. Chanthima, N., Srisittipokakun, N., Kaewkhao, J. and Limsuwan, P., “Investigation on Physical Properties of Borosilicate Glasses Containing Barium”, Proceeding of The 4th International Science, Social Science, Engineering and Energy Conference (I-SEEC 2012), 11-14 December 2012, Golden Beach Cha-Am Hotel, Phetchburi, Thailand, pp. 497-502. 73. Limkitjaroenporn, P., Tuschareon, S., Kaewkhao, J., Jeongmin, P. and Kim, H.J., “Mass Attenuation Coefficients and Related Parameters of Citrine at Different Gamma Rays Energy using Compton Scattering Technique”, Proceeding of The 4th International Science, Social Science, Engineering and Energy Conference (I-SEEC 2012), 11-14 December 2012, Golden Beach Cha-Am Hotel, Phetchburi, Thailand, pp. 503-511. 74. Boonin, K., Chimalawong, P., Srisittipokakul, N. and Kaewkhao, J., “Optical properties of Sm3+-Doped soda-lime silicate Glass System”, Proceeding of The 4th International Science, Social Science, Engineering and Energy Conference (I-SEEC 2012), 11-14 December 2012, Golden Beach Cha-Am Hotel, Phetchburi, Thailand, pp. 519-523. 75. Kirdsiri, K., Srisittipokakun, N., Ruangtaweep, Y., Kaewkhao, J. and Limsuwan, P., “Role of Er2O3 on physical and optical properties of borosilicate glasses”, Proceeding of The 4th International Science, Social Science, Engineering and Energy Conference (I-SEEC 2012), 11-14 December 2012, Golden Beach Cha-Am Hotel, Phetchburi, Thailand, pp. 545-550. 76. Mungchamnankit, A., Ruengsri, S., Angnanon, A., Srisittipokakun, N. and Kaewkhao, J., “The Effect of Heat Treatment and CO2 Atmosphere on Color Changing in Zircon”, Proceeding of The 4th International Science, Social Science, Engineering and Energy Conference (I-SEEC 2012), 11-14 December 2012, Golden Beach Cha-Am Hotel, Phetchburi, Thailand, pp. 564-569. 77. Yasaka, P., Kaewkhao, J., Kim, H.J., Jayasankar, C.K., Limsuwan P., Chewpraditkul, W. and Pattanaboonmee, “Emission and Optical Properties of Eu3+ doped Zinc Bismuth Borate Glasses”, Proceeding of The 4th Burapha University International Conference 2013 Burapha University, Thailand 4-5 July 2013, Jomtien Palm Beach Hotel&Resort, Pattaya, Thailand, pp. 557-563. 78. Rakpanich, S., Kaewkhao, J., Boonin, K., Chanthima, N, Kim, H.J.and Limsuwan P., “Influence of Excitation Wavelength on Luminescence Properties of Sm3+ in Bismuth Borate Glass”, Proceeding of The 4th Burapha University International Conference 2013 Burapha University, Thailand 4-5 July 2013, Jomtien Palm Beach Hotel&Resort, Pattaya, Thailand, pp. 595-601. 79. Ruamnikhom, R., Horprathum, M., Eiamchai, P., Chanthima, Kaewkhao, J., and Limsuwan P., “NIR Luminescence properties of Nd3+ and Er3+ ions doped Bi2O3–BaO–B2O3 glass system”, Proceeding of The 4th Burapha University International Conference 2013 Burapha University, Thailand 4-5 July 2013, Jomtien Palm Beach Hotel&Resort, Pattaya, Thailand, pp. 649-656. 84. Preechayan,T., Chanthima, N. and Kaewkhao, J., “Photon Interaction Study on Building Materials in Thailand for Radiation Shielding Materials Application”, The 4th International Conference on Science and Social Sciences 2014, 18-19 September 2014, Rajabhat Maha Sarakham University, Thailand, pp. 465-469. 87. Viswanath,C.S.D., Srisittipokakun, N., Kaewkhao, J., Jayasankar, C.K., “Spectroscopic and Reddish-orange fluorescence studies of Sm3+ doped borosilicate glasses”, The 23rd National Laser Symposium 2014 (NLS-23), 3-6 December 2014, Venkateswara University, Tirupati, India pp. CP-09-48. 88. Kaewkhao, J., “Glass Material Researches at Center of Excellence in Glass Technology and Material Science (CEGM), NPRU-Thailand”, The 3rd (SACT 2014), 22-23 December 2014, Pakse, Lao PDR pp. 11. 89. Chanthima, N., Thaowonkaew, S., Rittiruam, M., Vora-ud, A., Seetawan, T., and Kaewkhao, J., “Fabrication of Zinc Barium Phosphate Glass Doped with CuO for Transparent Thermoelectric Material Application”, The 3rd (SACT 2014), 22-23 December 2014, Pakse, Lao PDR pp. 52. 90. Limkitjaroenporn, P. and Kaewkhao, J., “Photon Interaction of Some Bulk Thermoelectric Material Using for Cryogenic Radiation Detector”, The 3rd (SACT 2014), 22-23 December 2014, Pakse, Lao PDR pp. 64. 91. Kirdsiri, K. and Kaewkhao, J., “The Mass Energy Absorption Coefficients for GeTe Infrared Detector: Theoretical Study for 1 KeV – 20 MeV”, The 3rd (SACT 2014), 22-23 December 2014, Pakse, Lao PDR pp. 65. 92. Srisittipokakun, N. and Kaewkhao, J., “Effective Atomic Numbers and Shielding Parameters of Lead Telluride at Selected Photon Energing”, The 3rd (SACT 2014), 22-23 December 2014, Pakse, Lao PDR pp. 66. 93. Yasaka, P. and Kaewkhao, J., “Photon Interaction of Bi2Te3 Thermoelectric Material”, The 3rd (SACT 2014), 22-23 December 2014, Pakse, Lao PDR pp. 67. 94. Boonin, K. and Kaewkhao, J., “Determination of Total Mass Attenuation Coefficients, Effective Atomic Numbers and Electron Densities of Sb2Te3 Thermoelectric Material”, The 3rd (SACT 2014), 22-23 December 2014, Pakse, Lao PDR pp. 68. 95. Wiwatkanjana, P. and Kaewkhao, J., “Photon Interaction Calculation of Mg2Si Thermoelectric Material using FFAST”, The 3rd (SACT 2014), 22-23 December 2014, Pakse, Lao PDR pp. 69. 96. Tuscharoen, S., Ruergtaweep, Y. and Kaewkhao, J., “Determination of Mass Attenuation Coefficients and Electron Densities for Zn4Sb3 Glasses at Different Energies”, The 3rd (SACT 2014), 22-23 December 2014, Pakse, Lao PDR pp. 70. 97. Rachniyom, W. and Kaewkhao, J., “Photoelectric Absorption Coefficient and Atomic Form Factors of Ca3Co4O9 Bulk Thermoelectric”, The 3rd (SACT 2014), 22-23 December 2014, Pakse, Lao PDR pp. 71. 98. Chaiphaksa, W. and Kaewkhao, J., “Comparative Study of photon Interaction of Mg2Ge Thermoelectric Material using WinXCom and FFAST” The 3rd (SACT 2014), 22-23 December 2014, Pakse, Lao PDR pp. 72. 99. Limkitjaroenporn, P., Seingsanor, K. and Kaewkhao, J., “Determination of the Effective Atomic Number from The Differential Compton Cross-section” The 6th (I-SEEC 2014), 17-19 December 2014, Prajaktra Design Hotel, Thailand pp. 307. 100. Tuscharoen, S. and Kaewkhao, J., “Photon Interaction Calculation of Lead Compound for Shielding Materials” The 6th (I-SEEC 2014), 17-19 December 2014, Prajaktra Design Hotel, Thailand pp. 308. 101. Limkitjaroenporn, P., Boonruan, K., Boontang, P., Sungwandech, S. and Kaewkhao, J., “The Experimental Gamma-Ray Build Up Factor of Lead at Energy Range 59.5 to 1332 keV” The 6th (I-SEEC 2014), 17-19 December 2014, Prajaktra Design Hotel, Thailand pp. 309. 102. 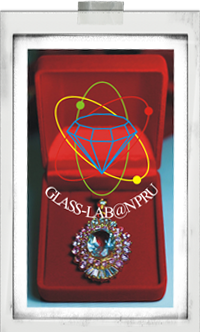 Kaewkhao, J., “Researches at Center of Excellence in Glass Technology and Materials Science, NPRU, Thailand”, The Sakon Nakhon Rajabhat University International Conference (SNRU-IC 2015), 24 July 2015, Sakon Nakhon, Thailand. p. 10. 103. Srisittipokakun, N., Angnanon, A., Kaewkhao, J., “Reuse Waste Plaster from Jewelry Industry by Composite in New Plaster”, The Sakon Nakhon Rajabhat University International Conference (SNRU-IC 2015), 24 July 2015, Sakon Nakhon, Thailand. p. 57. 104. Kirdsiri, K, Damdee, B. and Kaewkhao, J., “Photoluminescence and Optical Properties Study of Dy3+ Doped Lithium Calcium Borate Glasses”, The Sakon Nakhon Rajabhat University International Conference (SNRU-IC 2015), 24 July 2015, Sakon Nakhon, Thailand. p. 58. 105. Yasaka, P, Boonin, K. and Kaewkhao, J., “Structural and Photoluminescence Properties of Dy3+ in Zinc Bismuth Borate Glass”, The Sakon Nakhon Rajabhat University International Conference (SNRU-IC 2015), 24 July 2015, Sakon Nakhon, Thailand. p. 80. 106. Chanthima, N, Preechachan, T., Insiripong, S. and Kaewkhao, J., “Theoritical Study on the Basis of Photon Interaction Parameter for Dental Amalgam”, The Sakon Nakhon Rajabhat University International Conference (SNRU-IC 2015), 24 July 2015, Sakon Nakhon, Thailand. p. 143. 107. Kaewkhao, J. and Kim, H.J., “Development of Radioluminescence System for Ruby Indentification”, International Conference on Sensor, Sensor System and Actuator 2015 (ICSSA 2015), 5-6 August 2015, Bali, Indonesia. p. 4. 108. Sangwaranatee, N., Tariwong, Y., Chanthima, N., Kim, H.J. and Kaewkhao, J., “Study on the Observation of Eu2+ and Eu3+ ions in MgO-BaO-P2O5 Glass System”, The 13th International Symposium on Radiation Physics (IRSP-13), 7-12 September 2015, Beijing Conference Center, Beijing, , China, p. 108. 109. Insiripong, S., Meejitpaisan, P., Kedkaew, C., Kim, H.J. and Kaewkhao, J., “Raioluminescence and Optical Studies of Gadolinium Calcium Phosphate Oxyfluoride Glasses Deoped with Sm3+”, The 13th International Symposium on Radiation Physics (IRSP-13), Beijing Conference Center, 7-12 September 2015, Beijing, , China, p. 109. 110. Kaewkhao, J., Kothan, S., Tungjai, M., Kaewjang, S., Sarachai, S. and Tuscharoen, S., “Development of BaO-ZnO-B2O3 Glasses as a Radiation Shielding Material”, The 13th International Symposium on Radiation Physics (IRSP-13) , 7-12 September 2015, Beijing Conference Center, Beijing, China, p. 110. 111. Kaewkhao, J., Chanthima, N., Klysubun, W. and Kim, H.J., “XANES and Luminescence Studies of M2O3-CaO-SiO2-B2O3 (M2O3 = Y2O3 and La2O3) Glasses Doped with Dy3+ Ions”, The 13th International Symposium on Radiation Physics (IRSP-13), , 7-12 September 2015, Beijing Conference Center, Beijing, China, p. 111. 112. Kirdsiri, K., Damdee, B. and Kaewkhao , J. “Visible Luminescence of Eu3+ Ion in Lithium Barium Borate Glass”, ICG Annual Confercence, 20-23 September 2015, Bangkok, Thailand, p. 75. 113. Sangwaranatee, N., Kaewkhao , J. and Chantima, N., “Systhesis and Luminescence Properties of Sm3+ Doped Magnesium Bismuth Phosphate Glass”, ICG Annual Confercence, 20-23 September 2015, Bangkok, Thailand, p. 76. 114. Chantima, N., Ruangtaweep, Y. and Kaewkhao, J., “Optical Properties and White Emission from Dy3 Doped in Y2O3-CaO-SiO2-B2O3 Glasses”, ICG Annual Confercence, 20-23 September 2015, Bangkok, Thailand, p. 85. 115. Reungsri, S., Srisittipokakun, Kaewkhao, J., “Optical and Luminescence Properties of Dy3 Doped in Soda Lime Borate Glasses”, ICG Annual Confercence, 20-23 September 2015, Bangkok, Thailand, p. 86. 116. Kaewjeang, S., Meghanemi, U., Kothan, S., Kim, H.J., Kaewkhao, J., “Optical, Luminescence and Scintillation Properties of Eu3+ in Gadolinium Cacium Silicaborate Glass System”, ICG Annual Confercence, 20-23 September 2015, Bangkok, Thailand, p. 87. 117. Limkitjaroenporn, P., , Cheewasukhanont, W., Boonin, K. and Kaewkhao, J., “Radiation Shiedling Properties of Bi2O3-Na2O-B2O3 Glassesa at 662 keV”, ICG Annual Confercence, 20-23 September 2015, Bangkok, Thailand, p. 104. 118. Meejitpaisan, P., Ruangtaweep, Y. Kedkaew, C. and Kaewkhao, J., “Investigation on Photoluminescence Properties of Sm3+ Ions in Gadolinium Calcium Phosphate Glasses”, ICG Annual Confercence, 20-23 September 2015, Bangkok, Thailand, p. 105. 119. Rakpanich, S., Meejitpaisan, P., Ruangtaweep, and Kaewkhao, J., “Effect of Nd3+ Ion on Bismuth Borosilicate Glass Properties”, ICG Annual Confercence, 20-23 September 2015, Bangkok, Thailand, p. 144. 121. Djamal, M., Rajagukguk, J., Hidayat, R., Suprijadi and Kaewkhao, J., “Enhanced 1057 nm Luminescence Peak and Radiative Properties of Laser Pump Nd3+-doped Sodium Borate Glasses”, IEEE Conference Publications, 4th International Conference on Instrumentation, Communications, Information Technology, and Biomedical Engineering (ICICI-BME), 2-3 November 2015, Bandung, Indonesia, pp. 248-253 (indexed by Scopus). 123. Tariwong, Y., Chanthima, N., Kaewkhao, J. and Sangwaranatee, N., “Optical Properties and Judd-Ofelt Analysis of Dy3+ doped MgO-BaO-P2O5 Glass Systems”, IEEE Conference Publications, 4th International Conference on Instrumentation, Communications, Information Technology, and Biomedical Engineering (ICICI-BME), 2-3 November 2015, Bandung, Indonesia, pp. 264-267. (Indexed by Scopus). 124. Sarachai, S., Chanthima, N., Kaewkhao, J. and Sangwaranatee, N., “A Study of Photon Interaction and Radiation Shielding Properties of BaO:Na2O:SiO2:B2O3 Glasses”, IEEE Conference Publications, 4th International Conference on Instrumentation, Communications, Information Technology, and Biomedical Engineering (ICICI-BME), 2-3 November 2015, Bandung, Indonesia, pp. 268-271. (Indexed by Scopus). 126. Yasaka, P. and Kaewkhao, J., “Spectroscopic properties of samarium ion doped in zinc barium borate glasses”, The 41st Congress on Science and Technology of Thailand (STT41), 6th- 8th November 2015, Suranaree University of Technology, Nakhon Ratchasima, Thailand, pp. 4. 127. Siengsanoh, K., Limkitjaroenporn, P., Kaewkhao, J. and Chewpraditkul, W., “Comparison of the differential compton cross-section of Pb-Sn alloys with difference weight fraction”, The 41st Congress on Science and Technology of Thailand (STT41), Information Technology, 6th- 8th November 2015, Suranaree University of Technology, Nakhon Ratchasima, Thailand, p. 75. 128. Ruengsri, S., Srisittipokakun, N., Zaman Naz, F., Rooh, G. and Kaewkhao, J., “Structural and optical properties of Ho3+ in soda lime borate glasses”, The 41st Congress on Science and Technology of Thailand (STT41), Information Technology, 6th- 8th November 2015, Suranaree University of Technology, Nakhon Ratchasima, Thailand, p. 277. 129. Srisittipokakun, N.and Kaewkhao, J., “Effect of Co/Cr co-doped on physical and optical properties in soda lime silicate glass”, The 41st Congress on Science and Technology of Thailand (STT41), Information Technology, 6th- 8th November 2015, Suranaree University of Technology, Nakhon Ratchasima, Thailand, p. 291. 130. Kirdsiri, K. and Kaewkhao, J., “Fabrication and some properties of Dy2O3 doped lutetium-calcium-silico-borate glasses”, The 41st Congress on Science and Technology of Thailand (STT41), Information Technology, 6th- 8th November 2015, Suranaree University of Technology, Nakhon Ratchasima, Thailand, p. 297. 131. Ruangtaweep, Y., Kaewkhao, J., Janlang, N., Tampouk, B. and Hongrungruangchai, A., “Effect of iron oxide on physical and optical properties of B2O3-Al2O3-CaO-Na2O glass”, The 41st Congress on Science and Technology of Thailand (STT41), Information Technology, 6th- 8th November 2015, Suranaree University of Technology, Nakhon Ratchasima, Thailand, p. 303. 132. Park, J.M., Kim, H.J., Ha, D.H., Chanthima, N., Ruangtaweep, Y. and Kaewkhao, J., “Luminescence of Dy3+ doped lanthanum-calcium-siligoborate glass scintillator”, The 19st International Conference on Accelerators and Beam Utilizations, 4th- 6th November 2015, Gyeongju, HOCO, Korea, p. 148. 134. Srisittipokakun, N., Zaman, F., Rooh, G. and Kaewkhao J., “Investigation of photoluminescence properties of paseodymium doped soda lime borate glasses”, The 7st International Sciencen, Social Science, Engineering and Energy Conference, 24th- 26th November 2015, Wangchan Riverview Hotel, Pisanulak, Thailand, p. 82-88. 135. Kirdsiri, K, Shamshad, L., Srisittipokakun, N., Rooh, G. and Kaewkhao J., “Luminescence Study of Sm3+ Doped Soda Lime Silicate Glasses”, The 7st International Sciencen, Social Science, Engineering and Energy Conference, 24th- 26th November 2015, Wangchan Riverview Hotel, Pisanulak, Thailand, p. 279-288. 139. Kaewkhao, J., “Development of Gadolinium Calcium Phosphate Oxyfluoride Glasses Doped with Eu3+ and Sm3+ for Luminescence and Scintillation Material Applications”, International Conference on Science and Technology of Emerging Materials (STEMa2016), 27-29 July 2016, Holliday Inn Pattaya, Thailand. 140. Kaewkhao, J., “Interaction of Photon to Glass Mateiral: Development of Radiation Shielding Glasses and Glass Scintillators”, The 2016 International Seminar on Sensors, Instrumentation, Measurement and Metrology (ISSIMM 2016), 10-11 August 2016, Brawijaya University, ,Malang, Indonesia, p. 8.